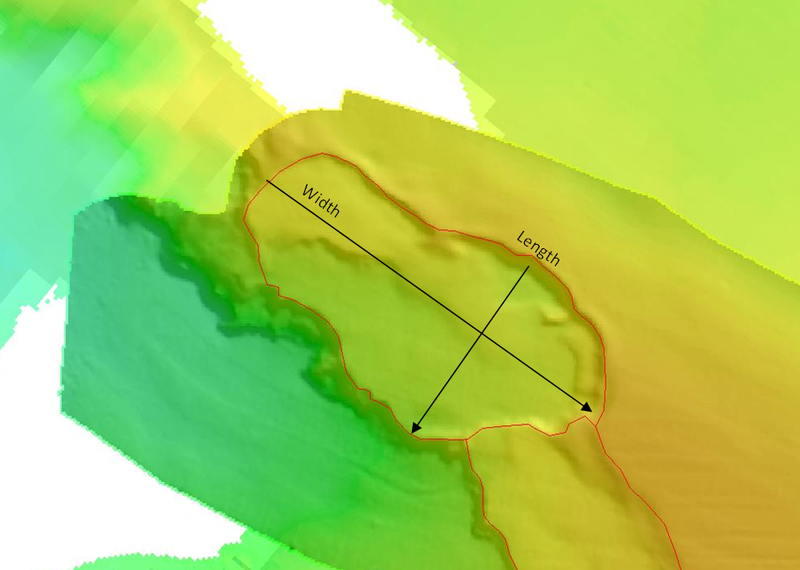 Within my project I am trying to quantify and compare different submarine landslides with ArcGIS. Therefore, I created a polygon shapefile and mapped the spatial extent of each landslide. Now I want to calculate next to other parameters their exact width and length. For landslides which are longer than wide, the Minimum Bounding Geometry tool works really fine. However, some landslides are wider than long and this tool is totally misleading in such a case. Does anyone know if there is a method/tool to calculate the real width and length? I would say no, as your length and width are not consistently (and somewhat arbitrarily) defined. That is, the areas you wish to measure are relative to the landslide location and orientation and are person-defined. For example, in the image you post I would say the length is actually the width and the width is actually the length. You define it this way as the landslide originated from the SW to the NW (somewhat), so I get it, but what if the landslide originated from the east and spread to the north of the image? You could do as the shoreline people do and have all landslide faces (the shorelines) defined as lines and then it would work but you need to define all your origins (landslide lines) as features otherwise only a human knows which is the length and which is the width of the resultant debris field. This is actually a good problem to address with AI as humans with a priori knowledge can do it easily and explain it easily but preexisting technologies cannot do it automatically as it is almost impossible to solve via a rule-based, pixel-based, or and object-based system even with prior knowledge. This is an untested answer but... generate a minimum bounding rectangle around each slide. Convert the rectangle to a line. Spit the line at each corner into four lines using Split Line at Vertices. Use Add Surface information (3D Analyst) to get the average elevation for each of the four lines. If the two long side average elevations are both higher and lower than the short sides average elevation you have slide that is wider than long. Not the answer you're looking for? Browse other questions tagged arcgis-desktop geometry extents length or ask your own question. Measuring shortest distance along line feature between 2 polygons? Creating query for set of polygons which would select adjacent polygons for which combined area is greater than number?